Today I began reading Avinash Kaushik’s Web Analytics: An Hour a Day. Supposedly I was going to read it for an hour (as the title clearly states!) but I found myself immersed in it for about 2 hours. The book is packed with useful terms, acronyms, companies, examples, best practices. All of this in just the first 49 pages. Just to name a few: customer driven innovation (CDI), Coremetrics, Omniture, WebTrends, WebSideStory, Clicktracks, comScore, packet sniffers, etc. A lot of food for thought for future posts here at idaconcpts.com. Originally I wanted to discuss about Kaushik’s trinity, whose objective is actionable insights and metrics, but I got caught with Microsoft adCenter Labs. Microsoft adCenter Labs is an applied research group dedicated to researching and incubating new digital advertising technologies. Formed in 2006, Microsoft adCenter Labs combines the talents of more than 120 top researchers and engineers, all dedicated to developing cutting-edge ways for consumers and advertisers to connect. Our researchers work across a broad range of technology areas, including keyword and content technologies, audience intelligence, ad selection and relevance, social networking, and video and interactive media. The algorithms developed by our team operate in the engines of Microsoft adCenter products such as Paid Search, Content Ads, and Behavioral Targeting. We are also committed to investing in developing online advertising products that will shape the future of advertising through more relevant and meaningful ads across online video, television and mobile devices. Learning lots indeed! Today I had to continue to network to learn more about the needs of organizing large collections of photographs. I cannot go into much details but I can tell you that gender distribution is a major factor in my analysis. One particular question that I have is what are the differences between male and female Mac (or Apple!) users, and how does their experience relate to their use of Flickr. Let’s use the Keyword Forecast tool from Microsoft adCenter Labs to find some insights into this question. So, I used the terms: Apple: Flickr; Mac. Originally I was going to just use Apple or Mac but after finding the results I found that there important differences about the keywords Apple and Mac. From the graph above, it becomes clear that before March 2007, the keyword Apple had a much higher trend than the keyword Mac, something happened in March 2007 that turned the tables around for the relationship between these two keywords. I would have to look into that and a useful tool for that would be Google Trends. But let’s continue to use this tool for now. Wow! According to this graph, it appears that for the period 04/2006 – 06/2007, the keyword Apple is associated mostly with females and the keyword Mac is associated mostly with males. This is a key finding for marketers trying to reach a particular gender of Mac (or Apple!) users. It appears that talking about Mac to a female audience of Powerbook users is not such a good idea! Earlier we discussed that Flickr.com is very related to Divinecaroline.com, so this would be an important to consider if Flickr is trying to reach female Apple users at the latter website. The keyword Flickr has almost neutral association with either women or men so the tipping point would be the use of Apple or Mac. 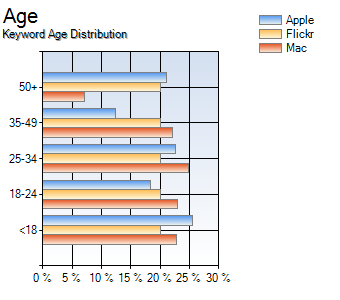 Lastly, the Keyword Search tool offers an age distribution bar graph. From the graph above, my main observations would be that 50+ old keyword users prefer the keyword Apple over Mac, and that 25-34 old keyword user prefer Mac over Apple. All other age distributions seem quite normal. Conclusion: vive le diference! 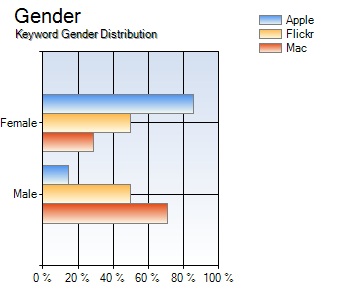 Gender is highly important for SEO for Mac related web analytics projects! I’ve found very interesting this particular post, women love Apple. I’m a woman, I love Apple. Just in case you need a real opinion, ha ha ha. Thank you Gemma, glad that you like it! For the last 2 weeks I have been contacting a lot of wedding photographers for work reasons, because I need to understand SEO for their websites. If I see one more wedding dress, I will jump of the 17th floor of our office! Ha, ha!